Discover the true spiraling and hypnotic potential of advanced stereo tremolo. 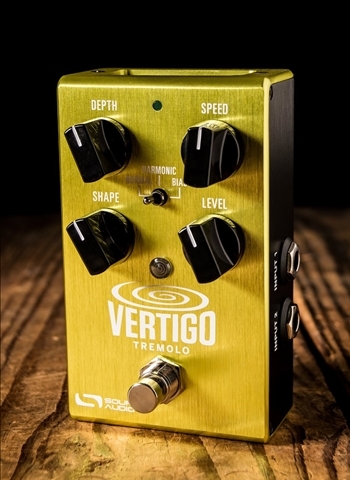 The Vertigo offers three distinct tremolo effects. Normal tremolo delivers a divine renewal of the thumping "opto trem" amplitude modulation found in vintage Blackface Fenders. Harmonic revives the haunting sway of the Fender Super’s "Vibrato" effect from the early 60s - this vintage tremolo ping-pongs between a low and high frequency boost, creating a swinging phaser-ish effect. Finally, the sweetly overdriven Bias tremolo creates the swampy “bias wiggle” of early tube bias modulation. The Vertigo takes the tonal possibilities a step further with its Shape knob, which allows users to morph the LFO wave shape from square, to sine or opto, to saw tooth. -3 Presets - use Preset Mode to save a different preset to each of the three toggle switch positions. When the pedal is engaged, all of the parameters instantly jump to their saved value, regardless of the knob positions. -Stereo Input and Output Jacks - Create deep and wide stereo modulation. -Universal Bypass - Select either analog buffered or relay based True Bypass. -Expression Control - Compatible with Source Audio expression pedals and the Hot Hand 3 Universal Wireless Effects Controller.